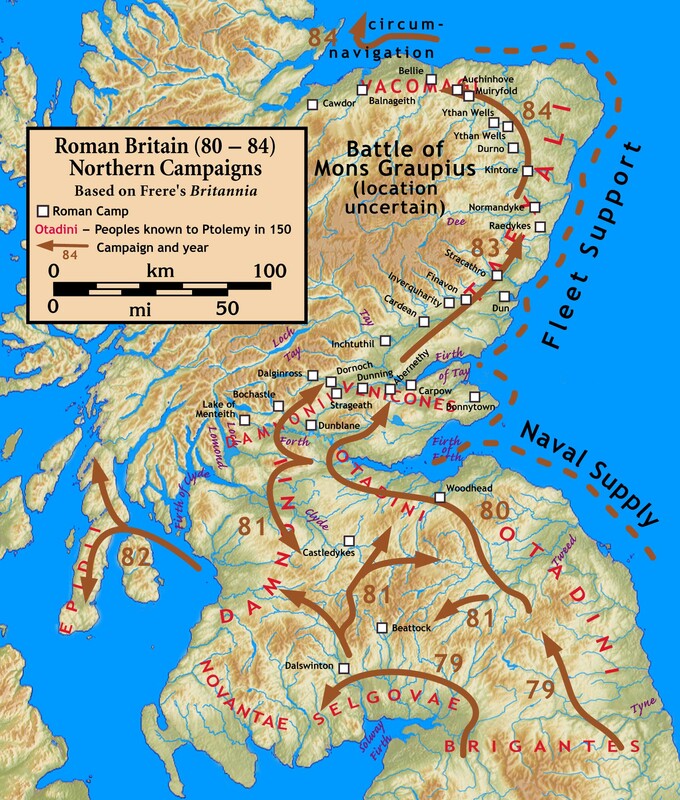 "As described by Tacitus, the Battle of Mons Graupius was a Roman military victory in what is now Scotland, taking place in AD 83 or, less probably, 84. The exact location of the battle remains a matter of debate. Historians have long questioned some details of Tacitus' account, and in recent years some historians have expressed doubt that the battle even took place, although that remains a minority viewpoint. According to Tacitus, Gnaeus Julius Agricola, who was the Roman governor and Tacitus' father-in-law, had sent his fleet ahead to panic the Caledonians, and, with light infantry reinforced with British auxiliaries, reached the site, which he found occupied by the enemy. Even though the Romans were outnumbered in their campaign against the tribes of Britain, they often had difficulties in getting their foes to face them in open battle. The Caledonians (Scottish) were the last to be subdued. After many years of avoiding the fight, the Caledonians were forced to join battle when the Romans marched on the main granaries of the Caledonians, just as they had been filled from the harvest. The Caledonians had no choice but to fight, or starve over the next winter." Nothing to support a battle on the scale Tacitus suggests having taken place has ever been found in the archaeology. The circumnavigation of Britain by Roman ships may have taken place years 5 years before Tacitus’ date. The account lacks key elements that would be expected to be found in an account of a battle. For example, there is no mention of rivers or other notable local features of the landscape, (in areas where there is invariably some kind of notable physical geography. Tacitus is not alone in introducing stock elements to his accounts. The Anglo-Saxon Chronicle presents a series of stock battle accounts typically ending with a gory, possibly politicised, account of the ruthless Viking blood eagle. Viking sagas are similarly repetitive in terms of accurate, chronological historical narratives. This may be because the purpose of some documents is not to record in the manner of modern political history, but the preservation of culture/ cultural history. Tacitus would be far from the only Roman writer following the Roman practice of using inflated figures. Many accounts note the figures are likely to be false, but go on to use them to state that a Roman victory occurred. Tacitus systematically belittles and degrades many non-Romans in his writings. This includes, Germans, Britons, Roman auxiliary troops, Jews and even Legionaries. E.g. Legionaries from Syria are presented as effeminate Asians. Insulting non-Romans was a historical convention in Roman propaganda and reduces the credibility of the speech's placed in the mouths of Boudica and Calcagus by making it clear that Tacitus was not concerned with presenting arguments for some form of universal freedom. He was quite possibly extending his political lifespan by presenting Rome as invulnerable when led by a new autocracy casting itself in the light of Rome's 'glory days'. Agricola is believed to have been honoured upon returning to Rome. The award of a victory triumph appears reliable in itself, but is not accompanied by the accompanying procedures, records and administrative accounts that might be expected to accompany the transition from hostile territory to an area under Rome's official rather than military hand. Victory triumphs were as much to do with Roman politics as with honouring officers - in addition if the earlier sections are to be believed Agricola had done enough in improving the running of the south that he didn’t need a risky adventure to claim a broad success during his time in 'Britain'. The Roman auxiliary troops claimed to have won a battle at Mons Graupius by using legionaries tactics and weaponry could not have been equipped with the Legionaries’ diamond-tipped Gladius, as it was too dangerous to give them to conscripted, foreign auxiliaries. The Roman auxiliary troops’ weapons were in all likelihood made by ‘British’ metallurgists, and more resembled a typical Celtic blade. The Battles of both Wattling bridgeand Mons Graupius are credited as Roman victories over potentially overwhelming numbers due to the efficiency of Roman tactics and equipment. Xenophon gives the same reason for a victory by, "locking their shields Together, they advanced and showed. 7.1.34 And because the Persians had to hold out their little shields clutched in their hands, they were unable to hold the line, but were forced back foot by foot, giving and taking blows." The auxiliaries taking part in Agricola’s campaign were in part recruited within 'Britain'. So Tacitus is claiming a Roman victory on the grounds that the Romans relied entirely on the cowardice of using ‘British’ and ‘Celtic’ troops as human shields. It was customary for a legion that didn’t engage the enemy to be seen as cowards, calling for the commander to commit suicide. Tacitus relates this earlier in his text on Agricola when another off the scale victory is reported at the Battle of Wattling Road. Tacitus was in the habit of putting rousing speeches in the mouths of those he wished to define as noble savages/ worthy opponents. Boudica’s speech and Calgacus’ speech are comparable to Xenophon’s account of Cyrus' in battle/ s. Details of Mons Graupius look to combine a standard approach to Roman deployment interspersed with sections of the earlier battle. The claim that Tacitus took much the account from former soldiers seems implausible, as the soldiers would surely have included more descriptive elements and seem unlikely to present an account of a battle recorded by Xenophon as their personal memoirs. Other texts by Tacitus, including Germanica, appear to be based on outdated information - much of it drawn from Pliny the Elder. It is not considered a factual, historical account of German tribes at the time. Though rarely mentioned, Diorus' histories do not always match with Tacitus' take on key details of other events that both covered. Agricola is claimed to have conquered or subdued the entire island, which is not how events unfolded. Tacitus appears to draw numerous emotive phrases from earlier authors. This seems to include Xenophon's work, where catch or stock phrases, such as a 'melting heart' metaphor, appear - Psalm 22 among other options. A further example is shown below. Tacitus uses highly emotive language to manipulate his readers. For example, TV programmes may use the emotional description of the aftermath of the supposed battle to persuade historians of Tacitus' sincerity. Tacitus' Agricola may well offer a Roman 'back to basics' political narrative, which set out a political road map for the Emperor Trajan and his new aristocracy. Tacitus converts words placed in the mouths of others into the presentation of the same material as solid history, e.g. Boudica’s speech from Agricola returns later without quotes in Annals, i.e. as a statement of fact. The size and location of Roman forts show a major Roman military presence on the ground in southern and parts of central Scotland. However, they would have been pushing their capacity and risking disaster to launch an expedition that left the rest of Scotland without a garrison when many supplies and any reinforcements had to be brought through southern and central Scotland. In other words, if there were the best part of 10,000 auxiliaries, plus two full legions, in the north - another full legion would seem an absolute minimum for securing areas of recently captured territory in Scotland. The Picts are said to have been forced to fight to protect their grain harvest. If a battle took place to the south of the often suggested locations in Moray and Aderdeenshire locations the grain harvest was far to the north and east. If it took place near to Inverness via the north east much of the harvest might have already been disrupted or seized. So the number of locations where this m,ight apply is limited. The military deployment described by Tacitus not only bears a resemblance to Xenophon's account of an earlier battle involving Cyrus. It also makes little military sense in the context of the highlands of Scotland. This is not a region where chariots easily chase back and forth over rough ground; nor was it common for auxiliaries to be left to do all the fighting. The Romans were consistently beaten back when they tried to go north. For example, Severus' later campaigns - where Roman loses were said to be higher than Tacitus proposes for Mons Graupius, the Antonine Wall, Hadrian's Wall, the Great Conspiracy and Gildas are among sources that show the Caledonians to be anything but subdued during the Roman occupation of 'Britain'. Caledonian tactics early in the campaign involved an opportunistic assault on Agricola's camp not a pitched battle. Throughout the campaign the Romans had to deal with guerrilla warfare presented by Caledonians who were familiar with Roman tactics, local geography and moving fast over steep ground. Military accounts are often distorted - with or without - government approval. Wikileaks release of data on Afghanistan shows what can go on. The losses put forward by Tacitus are truly remarkable. Roman auxiliaries were usually foreign troops recruited from conquered lands, apparently topped up with recruits from the south of Britain on this occasion. This makes it unlikely they had the level of military efficiency and good fortune to kills 10,000 with only a few hundred in reply. The costs of running such campaigns must have been quite, possibly, astronomically high. Especially at the very end of a long supply chain and in territory where guerrilla warfare was likely to cause disruption. After so long in Scotland and making very slow progress in the south, it is surprising that a Roman force of the claimed size would be sent out on such an expedition. For two legions to stand by throughout an entire battle may seem 'prudent', but using auxiliaries as human shields throughout a battle is at odds with the sense of honour demanded of a legion. Tacitus' text notes that a Roman commander who did not bring his legion to fight at another of Tacitus' remarkable, and location free battles, in England had to commit suicide. So, it seems curious that a victory would be awarded to legions for not taking part in a battle that didn't subdue the enemy for the foreseeable future. Doubts may also be attached to the contradiction between the Caledonians being forced to make a stand to save their recently harvested food and the sudden halt after the battle. Why would the Romans leave almost immediately without taking plunder or grain in significant and notable quantities. Winter may have been on the way, but we're talking a matter of a couple of weeks to raid surrounding areas abandoned by a routed force. Add to that the failure to make an immediate follow up at the time of the battle makes no military sense either. If you have 20,000 enemy on the run and two fresh legions - well in Tacitus' account of Wattling Bridge men, women and children were all put to the sword. "And deep silence reigned on every hand." "The silence of desolation reigned everywhere." Agricola marched a massive Roman army into largely unknown territory and succeeded where all others failed in bringing the Caledonians to open battle. The Caledonians had learned nothing during the Romans’ advance through Britain, suddenly dropped their successful tactics, and were cut down by a devastatingly effective group of recently recruited auxiliary troops. A Roman army led by cowards forced British and foreign conscripts to the Roman army to attack a united Caledonian force that sacrificed many heroic warriors to stop the Romans from conquering early Scotland. The Caledonians are unique in bringing Rome to a grinding halt with little more than the terrain and the weather to assist. A Roman army marched north and learned their lesson during the early years of hit and run attacks. After years spent marching round part of the borders with slow progress . . . Perhaps it made sense to provoke a battle and to sacrifice some auxiliaries in an attack on a significant but containable northern force. No battle of significant scale happened, because Rome had already realised that the years spent marching round southern Scotland didn't justify the expense and risked the disastrous loss of a legion/ s. It made political and military sense for all concerned to pull the plug. The Caledonians picked their spot well and caught a group of Roman auxiliaries in some numbers. The losses needed to be explained and the auxiliaries were reluctant to engage. Push came to shove and Agricola was unwilling to commit his legions to fight against opponents holding higher ground. Thirty thousand Caledonians laughed as the might of Rome staged a tactical and strategic withdrawal.